A few hours later, Nick spends Christmas morning recovering and in a perpetual daze possibly due to his recent flesh wound, the magic of the holidays, or – most likely – a large quantity of Scotch in his system. 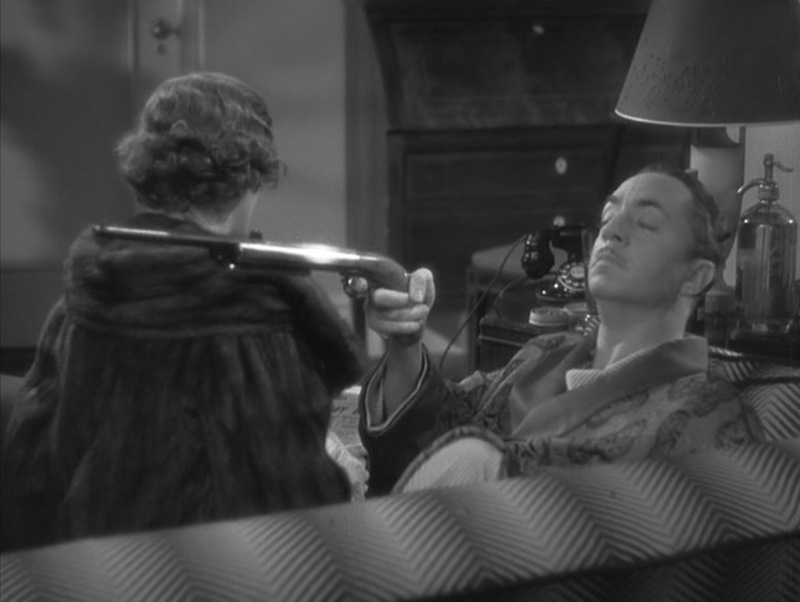 The Charles couple enjoys their Christmas gifts from each other: Nora in her mink coat from Nick, Nick playing with his air pistol from Nora. The casual nature of these scenes means Nick Charles steps out of his tailored suits and dinner jackets in favor of comfortable – but still classy – loungewear. 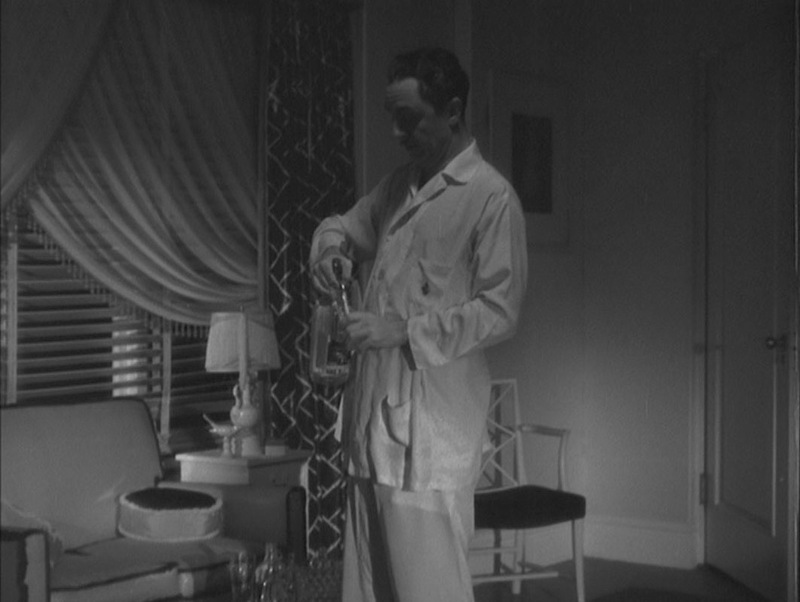 The first of Nick’s loungewear ensembles is the silky white two-piece pajama suit he wears on Christmas Eve when confronted by Joe Morelli in his room. The thigh-length pajama top has a one-piece camp collar with a small button at the neck that Nick leaves open, with three larger sew-through buttons down the very wide front placket. In addition to the three buttons, the pajama top has a belted waist that ties in the front. In addition to the two patch pockets below the belt, the pajama top has a breast pocket monogrammed with “NC”. It would seem that a true gentleman has at least one pair of monogrammed pajamas. The plain pajama bottoms are loose with a straight fit through the legs to the plain-hemmed bottoms. The lightweight material reveals a pair of white boxer shorts worn under the pants. 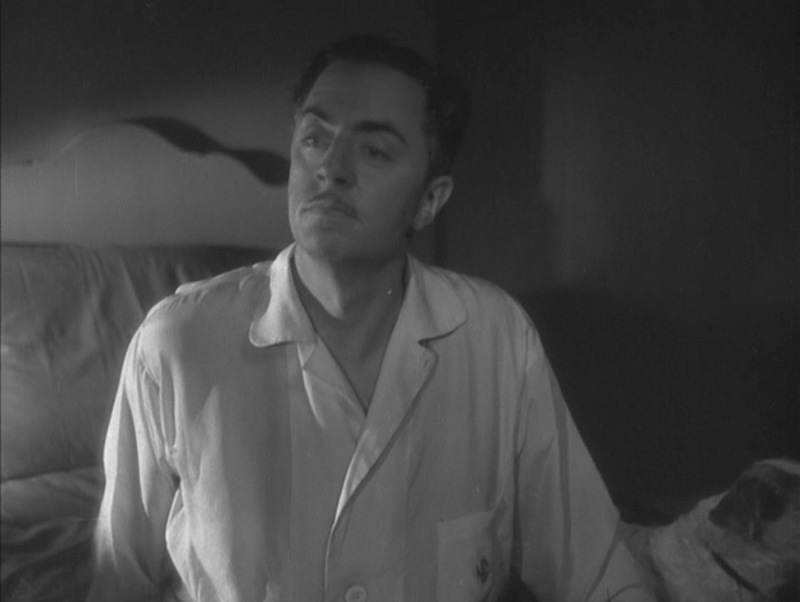 This first set of white pajamas is evidently bloodied – and likely ruined – after Nick is shot in the tabloids, and he has changed into a pair of similarly styled bengal-striped cotton pajamas for a lazy Christmas morning with Nora, worn under a heavy brocade-patterned dressing gown. 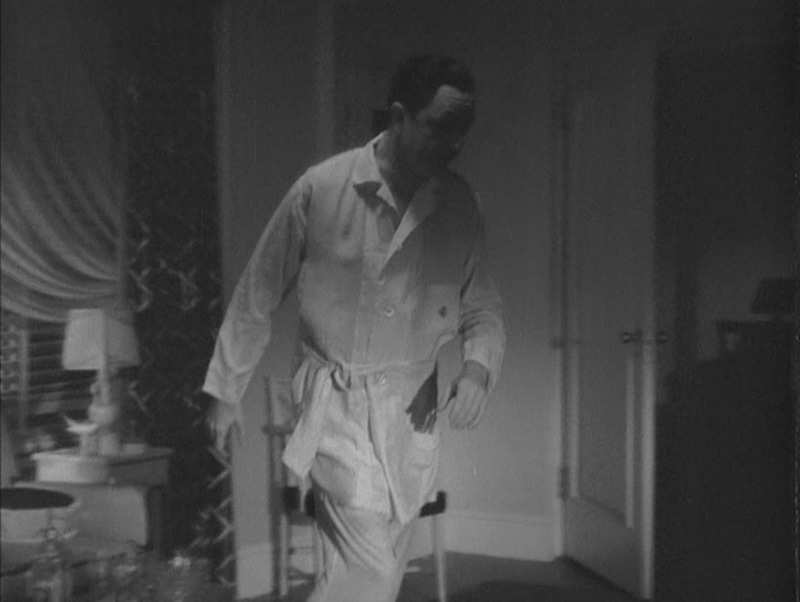 These pajamas share some consistent styling with the solid white pair, notably the belted, three-button pajama top and the monogrammed breast pocket, although this pajama top seems to have a slightly longer collar and cuffs on the trouser bottoms and at the ends of the long sleeves. 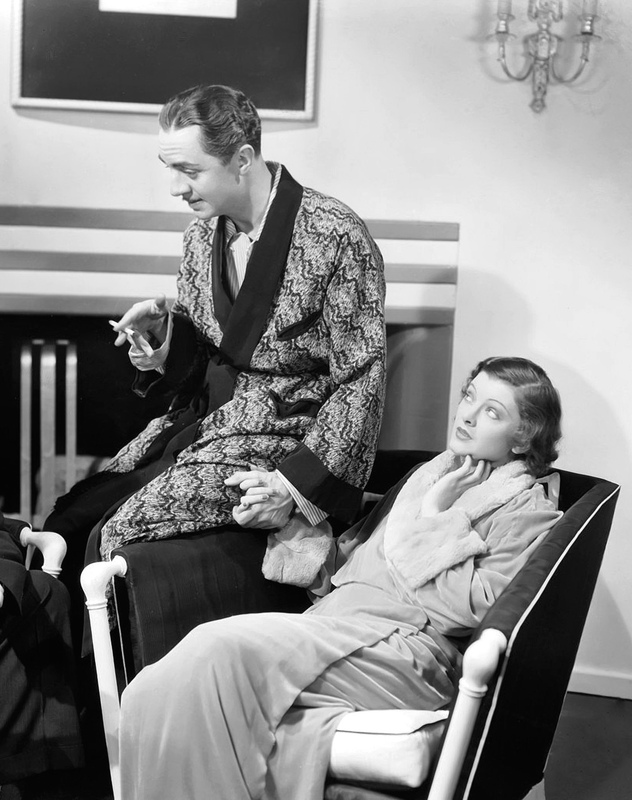 These pajamas also make an appearance during the final scene as Nick and Nora ride back to California on the train. 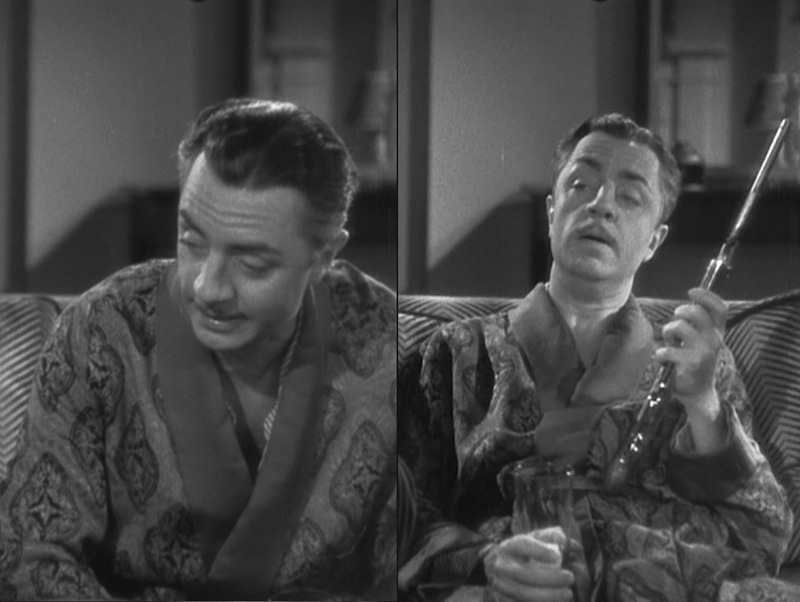 Nick’s first dressing gown is the heavier of the two he wears in The Thin Man, and it extends down past his knees to nearly his ankles as was common for men’s dressing gowns in the 1930s. The print is a large, regal diamond-centered brocade pattern that repeats throughout the robe on a medium-colored ground. 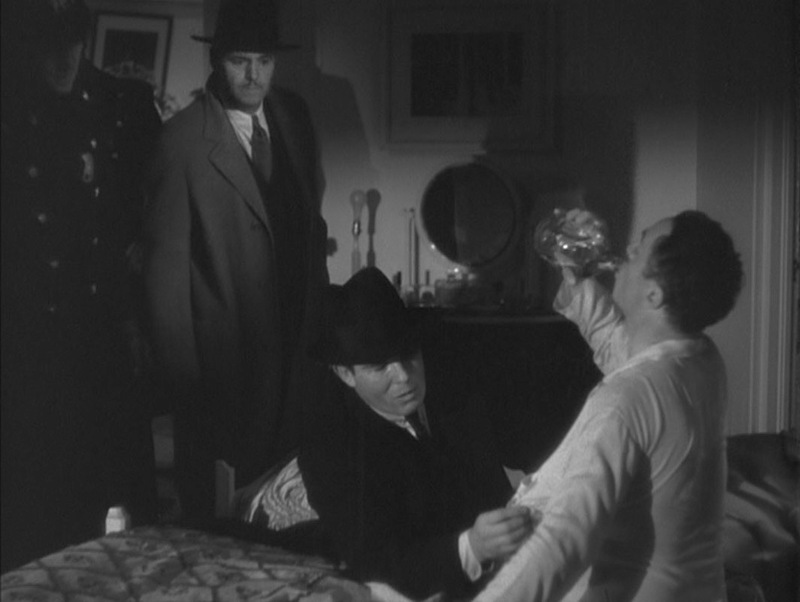 The robe has wide shawl lapels in a medium tone with little contrast against the rest of the robe (at least in the film’s black-and-white state) and matches the turnback cuffs at the end of each sleeve. The same patterned fabric as the rest of the robe is used for the belted sash, but the top and bottom of the sash are trimmed in the same medium-colored fabric as the collar and cuffs. Lounging around on a lazy Christmas morning. Nick wears a pair of open-heel slippers with hard leather soles and light-colored wool uppers that have a dark leather strip at the openings. Nick takes aim at a rogue Christmas ornament. 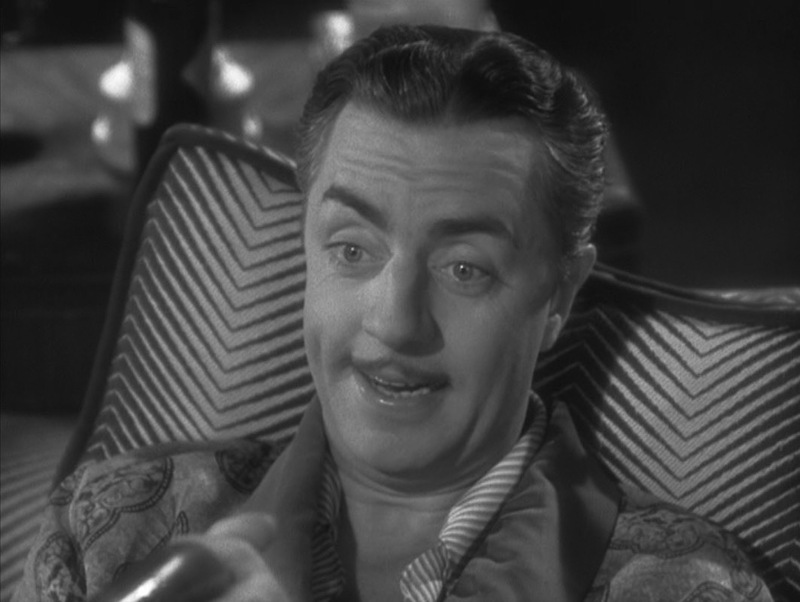 At the end of the film on the train to California, as well as in much of The Thin Man‘s promotional photography, Nick wears a different silk robe with a more abstract “zigzag” jacquard pattern and a contrasting dark shawl collar that matches the sash, cuffs, and trim along the top of the breast pocket and hip pockets. 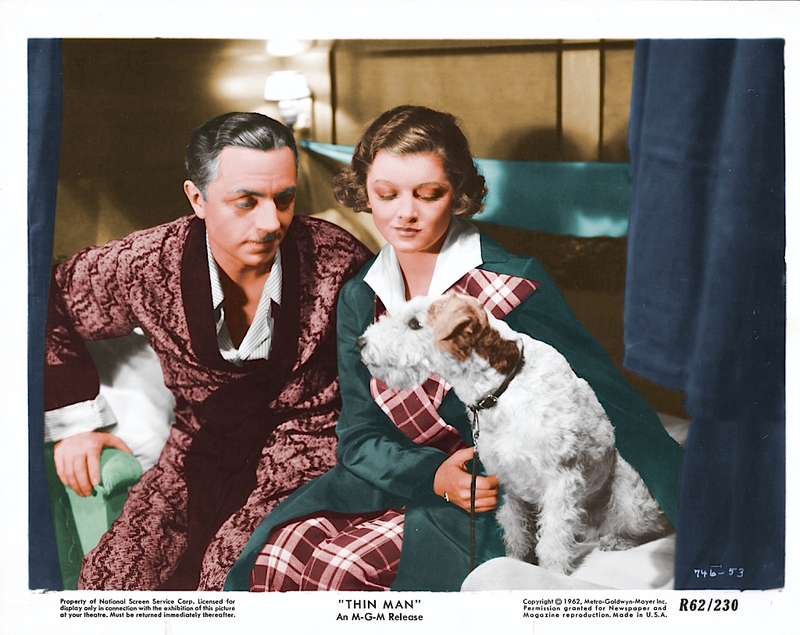 Contemporary posters and promotional artwork for The Thin Man feature Nick in a long mint green robe with a black shawl collar, likely meant to be this latter garment, but an alternative coloration can be found on some lobby cards from the time of the film’s release that put Nick in a red duo-tone patterned dressing gown. This 1934 lobby card illustrates Nick and Nora in shades of red and green: traditional Christmas colors that would have been appropriate for the film’s holiday setting. After being awakened by Nora in the middle of the night, Nick Charles had already been planning on a much-needed highball to help him get back to sleep. However, a surprise visit from an armed Joe Morelli and his quick trigger finger meant a slight flesh wound for Nick… and an even greater need for the erstwhile detective’s favorite medicine. Nick Charles skips counting sheep and goes straight to chemical sleep aids. Nick: Aw, baby, it’s only a scratch. Nick: What do you think? Haig & Haig Dimple Pinch blended whisky, the preferred Scotch of Walter White and the literary James Bond, is Nick and Nora’s nightcap of choice, kept in their room with a convenient siphon of soda water, as needed. Of course, a GSW is no joke so Nick doesn’t bother with the water – or a glass – when he grabs the bottle to speed along his recovery. The upmarket cousin of Haig’s Gold Label (featured in The Spy Who Came In From the Cold), Dimple was bottled in a distinctive “pinch” receptacle that gave the American variant its name. Both the British “Dimple” and the American “Dimple Pinch” are created from a blend of 15-year-old whiskies, though the latter expression is slightly stronger at 43% ABV (86 proof) than its 40% ABV British cousin. Unfortunately for any of you witty sleuths out there, Haig discontinued Dimple and Dimple Pinch decades ago, and even the company itself stocks only bottles from the 1940s through the 1960s in its online shop. 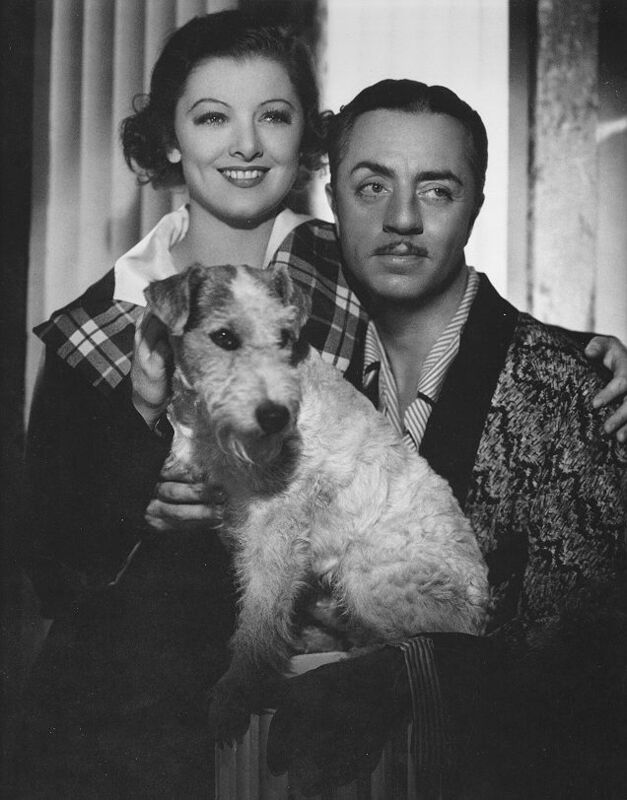 William Powell and Myrna Loy as Nick and Nora Charles in The Thin Man (1934). Interestingly, this is actually the set that would be used as Julia Wolf’s apartment in the film. Nick Charles is a snappy dresser even when he has nowhere to be… and a smart selection of pajama suits and dressing gowns is exactly what a debonair gent should be prepared to don for that laidback morning of holiday celebrating… or convalescing. Nick Charles spends most of Christmas morning playing with his gift from Nora, a long-barreled air pistol with a smooth walnut grip. 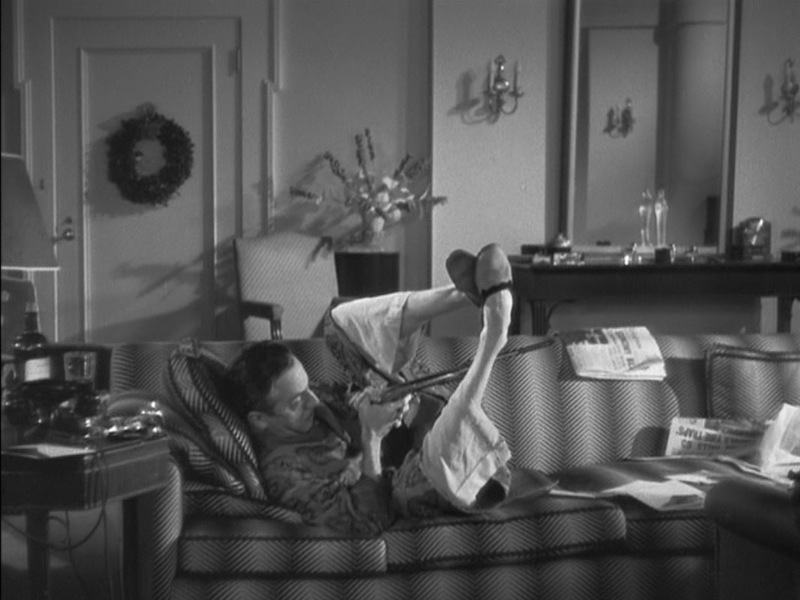 Supposedly, the scene as written didn’t feature the shots of Nick clowning around with his gift, but the decision was quickly made after the filmmakers were entertained by William Powell’s antics as he picked up an air gun and began sniping away at the ornaments being placed on set by the art department. This distinctive-looking, spring-operated air gun has been identified by IMFDB as a 1870 Swiss Tell 1 Air Pistol, though available details are scarce anywhere beyond that. The little I have been able to find, thanks to the Blue Book of Gun Values, explains that Oskar Will formed the Venuswaffenwerk manufacturing company in Zella, Germany, in 1844. Venuswaffenwerk manufactured air guns for more than a century, ceasing production in the late 1950s. The scene displays a very charming side to Nick’s easygoing personality, though Nora’s subtle annoyance at his decor destruction may well have paralleled the sentiments of the art department folks who had worked hard to decorate the Charles’ apartment for the holidays. Buy the entire film series. Haven’t seen this film since the ‘80s. On VHS! Been meaning to replace it with a dvd copy. It’s a shame that Hammett didn’t write an entire series of Nick and Nora stories. 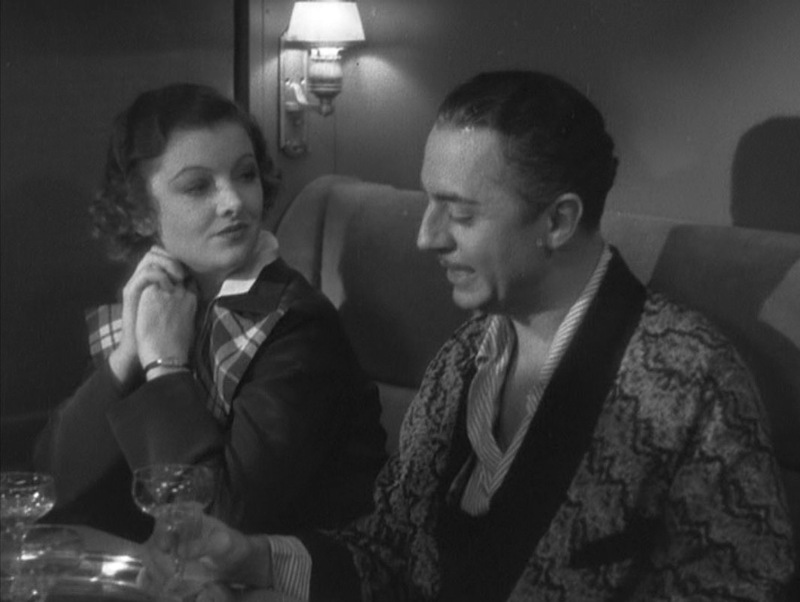 And yes, I can recall Myrna Loy’s expression while William Powell shoots out the ornaments in the room. I missed out on Christmas wishes, so I’ll just wish you a safe and Happy New Year, LS! One of the greatest films of all time, and the beginning of one of Hollywood’s most inspired pairings. Great job, always wondered about those pajamas.